On Wednesday night, our community stood up for mental health, raising $59,400 to support our neighbors in their journey to #RestoringHope. 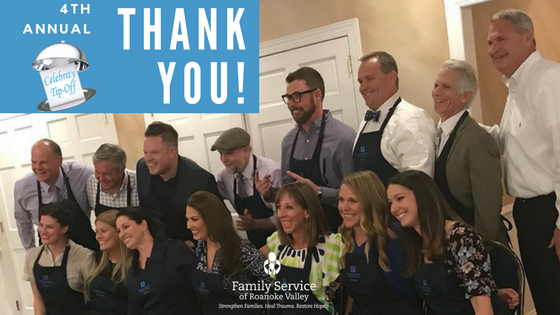 Thanks to you and our celebrity waiters, the success of Celebrity Tip Off allows people in our community to receive the help they need, when and where they need it. With #MentalHealthAwarenessMonth starting in just a few weeks, I just knew (*wink wink*) you all wanted to know more about our celebrity waiters and why they champion mental health for our community. Dr. Jennifer Walker, owner of Balance Wellspace, wholeheartedly believes mental health is a major social issue in our community. (Side note: also very much in her heart = Family Service. We <3 too Dr. Walker!). She’s here with us to let everyone know there are people who have your back. If she could change anything, it would be better access and better coverage for our community. She wants to see better education in our community surrounding mental health. With more education, there will be less stigma when people reach out for help. Tay Whiteside, of Black Dog Salvage and Salvage Dawgs, has his own experiences with mental health and wants everyone to know that therapy works. He had a fantastic time at Celebrity Tip Off last year, and combined with his positive therapy experience–you’ll understand Tay’s excitement to champion mental health. He says going to talk with a professional was extremely terrifying at first, but it helped his life so much! If you get nothing else from Tay’s comments, here’s his take away for you: it’s normal to have mental health issues to deal with, and it’s normal to get help just like he did. Carolyn Kiser, of Hometown Bank and Blue Cow Ice Cream (sorry Jason, I got to your wife without you around…you were probably off being an awesome waiter) has always been supportive of mental health awareness. She’s a past board chair of Family Service and knew this event was the way to get more people in her life involved in supporting mental health services. Access to care is a big priority for her, but so is abolishing stigma. She says if people no longer treated mental health as a taboo subject, our community would be a better place. Dr. Robert Trestman, Chair of Psychiatry and Behavioral Health at Carilion Clinic–so like y’all know this is more than a cause for him, it’s his job! He can’t be in the trenches every day, so he uses every opportunity to promote mental health awareness and change the stigma attached to speaking out. He’s a supporter of Medicaid expansion because he wants more people to have access mental health care. Madison Madden, of GLAMHOUSE Day Spa, knows everyone is affected by mental health and it’s extremely important to adjust the perception of asking for help. She believes more people should feel that mental health issues are normal. She’s humbled to have the opportunity to stand with her other waiters for a cause that literally affects our whole community, even if everyone doesn’t know it yet. Barry Ward, of Cushman & Wakefield / Thalhimer, believes mental health is a critical component in the Valley. He says speaking out about it helps folks understand they can heal. Everyone has a different personality, different ways to learn, and different experiences that shape them. He hopes to bring awareness to all methods of mental health treatments. From counseling or music therapy, he wants them all to be recognized as opportunities to restore hope. Sara Sloan, of Deschutes Brewery Roanoke Tasting Room, is saddened there are people who don’t know they can get help. She says we all have our own issues and it’s perfectly okay to seek professional counseling and work on life’s more challenging situations. That’s why she’s advocating for mental health awareness. Not only does she want more people to be aware receiving mental health services can help them, it will also help our community become a better place. I’m so grateful and honored to have had the opportunity to speak with our celebrity waiters this year and last. The invisible wounds of mental health are much easier to heal when you have passionate people who stand up and champion our most vulnerable neighbors. Our community and the cause of mental health awareness are better off becauce of people like our amazing waiters, volunteers, sponsors, diners and tippers! Thank you! !